Lock, Stock & Barrel is currently selling Timney triggers at 25% off normal retail. Triggers are available for most popular actions including Browning, CZ, Mauser, Remington, Ruger, Sako, Springfield, and Winchester. We are impressed with Timney’s new Rem 700 “Tactical” trigger (item TM501T). This Rem Tactical trigger adjusts from 4 to 10 ounces pull weight. It features a knurled Anschutz-style vertical trigger shoe that can adjust for angle (cant) and length of pull. The trigger housing is machined from solid steel, and all contact surfaces are CNC-machined steel that has been hardened, surface ground, and polished. 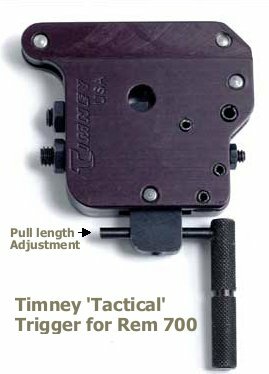 Timney’s Rem 700 Tactical trigger is now just $86.06 at LockStock.com. That’s a great deal. The same trigger sells for $134.95 on Timney’s Online Store, TimneyTriggers.com. 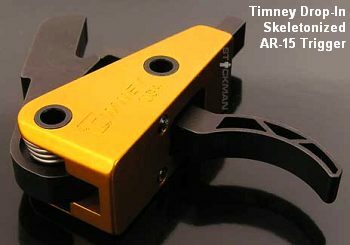 Timney also offers two new AR-15 triggers. The AR-15 Competition trigger is a true drop-in replacement for the standard fire-control system that uses your rifle’s original hammer/trigger pins. Timney claims the trigger module can be installed in ten minutes. It comes in 3- or 4-lb versions and features a crisp, one-stage pull. MSRP is $194.95, and a skeletonized version (shown below) retails for $234.95. Lock, Stock & Barrel does not list the new AR-15 trigger in inventory, but you can call for pricing, (800) 228-7925. Share the post "Timney Trigger Sale at LockStock.com"
Some of our forum members have observed issues with the Acculab VIC-123, an 0.001g precision electronic balance made by Sartorius. The two main complaints seem to be sensitivity to drafts, and instability of zero, causing weight read-outs to “drift” over time. We have seen the latter problem in less expensive scales such as the PACT. (Read PACT report). “It is necessary to isolate the scale from drafts and vibrations. 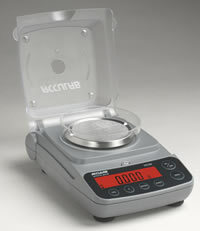 Laboratory scales with this sort of resolution (.001g) generally have a housing around the pan with sliding doors for access and vibration isolators in the feet. Those scales cost thousands of dollars, and some features must be cut to reach a price we’re willing to pay. Unfortunately, the instruction manuals accompanying our scales generally aren’t very good at spelling out the steps necessary to have then operate to our satisfaction. A small draft (one you can barely feel) can easily shift the reading a few tenths of a grain, so some sort of enclosure is needed. I use a cardboard file box with one end cut out, so 3 sides and the top remain, and that’s good enough for 0.1 gr (6 mg) stability; however, that may not be sufficient for 0.01 gr. For stable zeros it’s necessary to warm up for at least a few hours (they’re generally left on continuously to avoid drift) and keep the room temperature fairly constant (within a few degrees). Share the post "Advice for Acculab 123 Scale Users"
Don’t worry. Every Bulletin entry is archived, and each is listed by one or more categories as well. You can search for a past entry by keyword, or just click on a category. If you want to watch a video again, just click on “Videos”. If you saw a review of a scope, click on “Optics”, or do a word search such as “Nikon” or “reticle”. The “Articles” item at the top of the list will bring up posts that link to a longer feature article on this site or elsewhere. Once you get the hang of it, you should find it easy to find stuff using the navigation tools. The search is fast and effective. 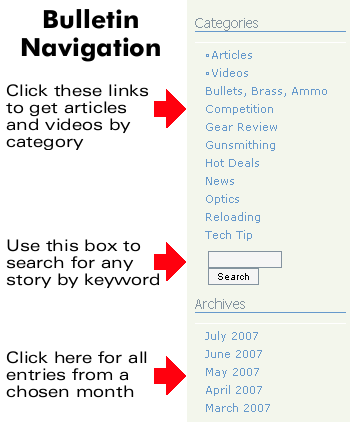 The illustration below shows how to use the navigation tools, found at the upper right of this page. Share the post "Finding Older Posts in the Bulletin"